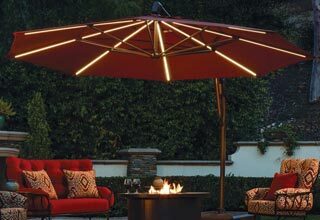 Santa Ana customers can count on Patio Place for low pricing on brand name patio furniture in wicker, cast aluminum, and extruded aluminum styles, as well as patio umbrellas, bar stools, ceramic gas logs, reflective fire glass, fire pits, barbecues, barbecue accessories and parts, stand-alone grills, kegerators, fridges, and more. Established in 1989, our family-owned business has been negotiating the best prices on new and prior seasons' outdoor furniture, equipment, and accessories, so we can offer some of the best prices on patio furniture in Orange County. We're an authorized dealer for the names you trust: Alu-mont, Patio Renaissance, Sunset West, Galtech, Fire Magic, Hanamint, Treasure Garden, and others, which means that in addition to discounts of almost 50%, we can also provide you with knowledgeable, expert recommendations for everything we sell. Whether you want to stay under your budget, complement your existing decor, or determine whether to revive or replace your old patio furniture in Santa Ana, call Patio Place for the help you need. We offer those in Santa Ana the best deals on brand name patio furniture from Gensun, Hanamint, and other quality brands. 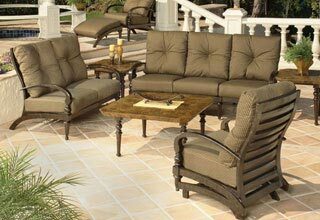 We sell many of the finest outdoor sofas, bistro tables, coffee tables, end tables, granite tables, benches, ottomans, lounge chairs, chaise lounges, lounge beds, loveseats, modular seating, dining sets, patio sets, and more. Whether you're looking for patio furniture in wicker, extruded aluminum, or cast aluminum styles, we have options that will help you stay within your budget and match your decor. Call today and ask about our large patio furniture inventory, on-going close-out sales, custom-made patio furniture, or convenient, on-site consultations for larger, commercial orders. Visit Patio Place today and receive huge discounts on brand name fire pits and fire tables, all of which are easy to use, designed to last, and available in a variety of styles and designs. 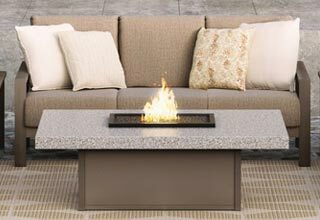 We offer Santa Ana beautiful cast aluminum, marble, and slate fire pits, as well as custom-ordered fire pits crafted in your choice of granite, travertine, or other quality material. We also sell brand name bar stools in various heights, styles, and designs to provide comfortable seating around your fire pit/table at an affordable price. Our bar stools can also feature foot rests, back rests, swivel components, and cushions. We provide Santa Ana customers with beautiful patio umbrellas from the best brands on the market, such as Galtech, Treasure Garden, and NorthCape, all available at the lowest prices in Orange County. We carry cantilever umbrellas, custom-made umbrellas, auto-tilt umbrellas, side-post umbrellas, table umbrellas, and lighted umbrellas. We also sell a wide variety of attractive umbrellas bases (available in varying weights, from 50 to 80 pounds) and umbrella lights (available in plug-in and solar-power models). From selecting patio umbrellas in your preferred style, size, and design, to finding quality patio umbrellas in a price to fit your budget, we will help you with all your patio umbrella needs in Santa Ana. Visit us today. Purchased at rock-bottom prices from the industry's leading manufacturers, such as Real Fyre and Fire Magic, our barbecues, grills, and gas logs are offered to those in Santa Ana at a significant discount. We sell standalone barbecues and grills, which we can convert to and from propane or gas, and can also remove and install replacement BBQ parts (such as burners, access doors, drawers, and more). We also sell vented and unvented gas logs, river rocks, reflective fire glass, lava rocks, and more. Visit today. Why buy a new patio umbrella when you can repair your existing umbrella at a fraction of the cost? At Patio Place, we specialize in umbrella restringing, recovering, and rib replacement that is low cost, attractive, and long-lasting. We can recover your Santa Ana umbrella with one of over 600 quality fabrics, all of which are durable, UV-resistant, and warrantied for years against fading, mildew, and other damage. We can even silkscreen your umbrellas (as well as your awnings) in Santa Ana with a business name or logo. Call today. For cost-effective patio furniture repairs, call Patio Place today. We specialize in refinishing weathered and faded outdoor furniture frames, as well as custom-making replacement outdoor pillows and cushions. We've replaced thousands of outdoor cushions for customers in Santa Ana and throughout Orange County. Our custom patio chair cushions, settee pads, tufted cushions, bench cushions, outdoor pillows, ottoman pads, sofa pads, and more come in standard and custom sizes. Our rates are always competitive and we have over 600 brand name fabrics to choose from, including a diverse selection from Sunbrella, Phifer, and most original manufacturer fabrics. Protect your patio furniture with standard and custom-made covers by Patio Place. Unlike store-bought covers, ours will not only last for years, but also provide a perfect fit for your outdoor furniture and equipment. Our custom-made covers are fabricated in-house and can be made to cover any size patio table, patio sofa, patio chair, fire pit, or barbecue grill in Santa Ana. Call us today to learn more.